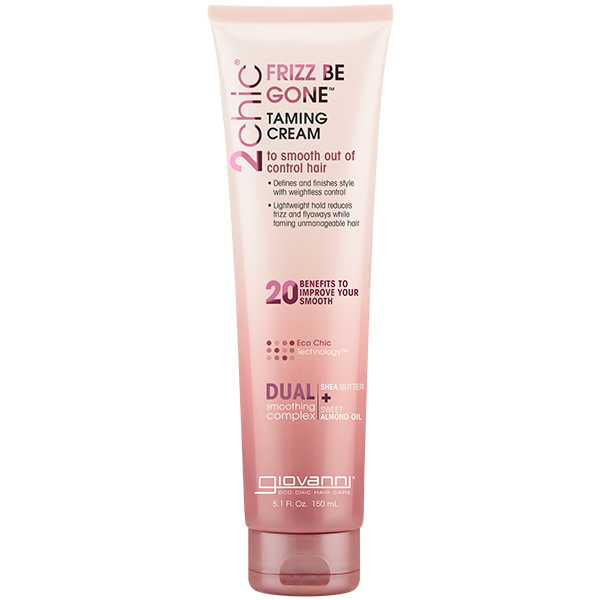 Home / HairCare / Giovanni 2Chic Frizz Be Gone. Giovanni 2Chic Frizz Be Gone. 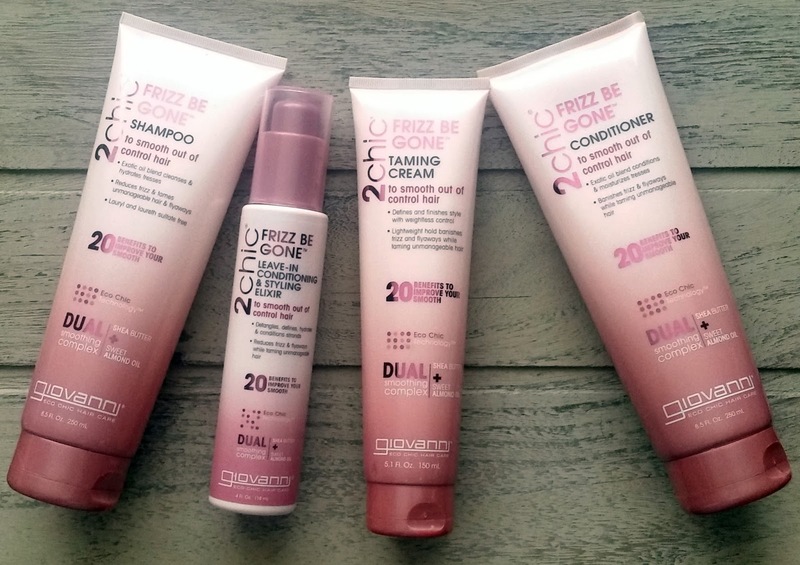 The Giovanni 2Chic Frizz Be Gone is a complete range to banish the frizz whilst also offering 20 benefits to improve your smooth. Giovanni's principles are based on beauty from the elements and beauty from within. Giovanni's pioneering formulae includes vitamins, herbs, minerals, proteins and nutrients that ensure your hair & skin looks and feels its best. The simple, yet unique bottles, add a funky modern twist to the bathroom whilst also ensuring you are able to get every last drop of product to use. 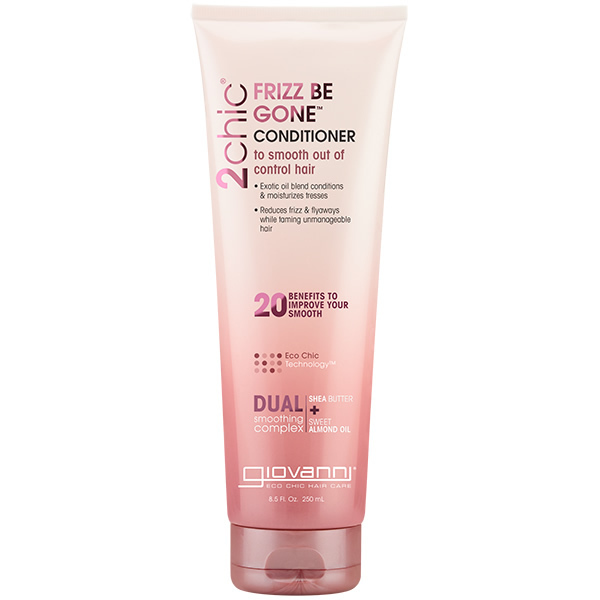 The Giovanni 2Chic Frizz Be Gone Range offers a dual smoothing complex that is SHEA BUTTER + SWEET ALMOND OIL to smooth out of control hair. The frizz be gone range ethic is Frizz Be Still, Frizz Be Gone™, Frizz Decoded, each product from the range lists 20 benefits your hair will benefit from and is 100% Vegetarian Ingredients / No Animal Testing. Giovanni do not add parabens, lauryl or laureth sulfate, dyes or PEGs to their products. 1. Cleanses Hair 2. Soft Finish 3. Controls Frizz 4. Smooths Strands 5. Increases Shine 6. Hydrates Tresses 7. Moisturizes 8. Color Safe 9. Improves Elasticity 10. Silkens Hair 11. Re-energizes Locks 12. Strengthens Tresses 13. Renews Vibrancy 14. Banishes Impurities 15. Helps Prevent Breakage 16. Reforms Manageability 17. Helps Prevent Spit Ends 18. Disciplines Flyaways 19. Humidity Control 20. Lightly Conditions. A lovely light cleansing shampoo that moisturises the hair making it suitable to use everyday and ideal for coloured hair. 1. Conditions Hair 2. Revives Vibrancy 3. Controls Frizz 4. Smooths Strands 5. Polishes in Shine 6. Seals in Moisture 7. Hydrates Strands 8. Color Safe 9. Controls Static 10. Refines Volume 11. Detangles 12. Strengthens Tresses 13. Softens Tresses 14. Reinforces Hair Fibers 15. Protects from Damage 16. Creates Manageability 17. Prevents Spit Ends 18. Disciplines Flyaways 19. Won’t Weigh Down Hair 20. Beautifies Each Strand. I was surprised on just how great my hair felt through the rinse off stage, transforming hair to a soft and smooth state. 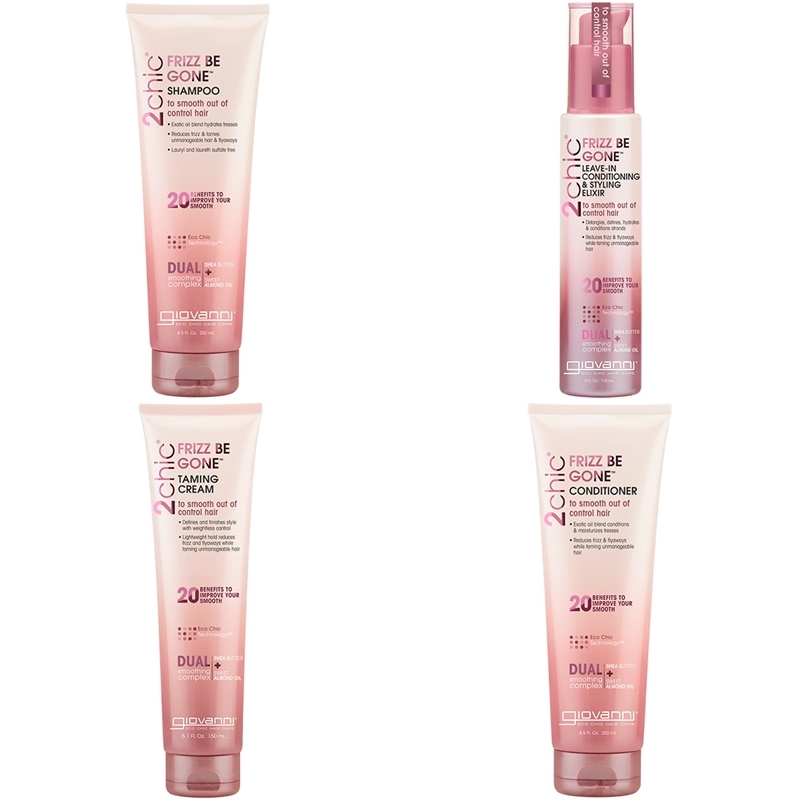 Just before adding the Giovanni 2Chic Frizz Be Gone products my hair felt hydrated, without feeling weighed down, like i had used an expensive hair mask. 1. Detangles 2. Soft Finish 3. Controls Frizz 4. Smooths Strands 5. Hydrates Tresses 6. Prevents Breakage 7. Re-energizes Locks 8. Adds Shine 9. Color Safe 10. Controls Static 11. Re-bonds Split Ends 12. Improves Elasticity 13. Strengthens Hair 14. Protects from Heat Styling 15. Defines Waves & Curls 16. Improves Manageability 17. Won’t Weigh Hair Down 18. Disciplines Flyaways 19. Humidity Resistant 20. Easy Comb-out. The pump dispenses just the right amount to use on your hair and instantly smooths the hair down helping it look shinier and healthier, without it looking greasy. You can also reach for this hydrating hair product when your hair needs a quick refresh during the day and makes a great overnight, light conditioning treatment for dry ends. 1. Soft to Medium Hold 2. Heat Styling Protection 3. Won’t Weigh Hair Down 4. Smooths Strands 5. Long-Lasting Control 6. Defines Waves & Curls 7. Rejuvenates Vibrancy 8. Style Manageability 9. Disciplines Flyaways 10. Prevents Breakage 11. Controls Frizz 12. Adds Shine 13. Soft Finish 14. Hydrates Tresses 15. Humidity Control 16. Color Safe 17. Distributes Easily 18. Adds Texture 19. Controls Static 20. Non-greasy. Applying to damp hair, the drying time was cut down dramatically whilst also protecting hair from the heat styling tools. Reaching for the taming cream the next day for a quick restyle, because it is non-greasy it does not overload the hair, it also holds your style quickly and all day. 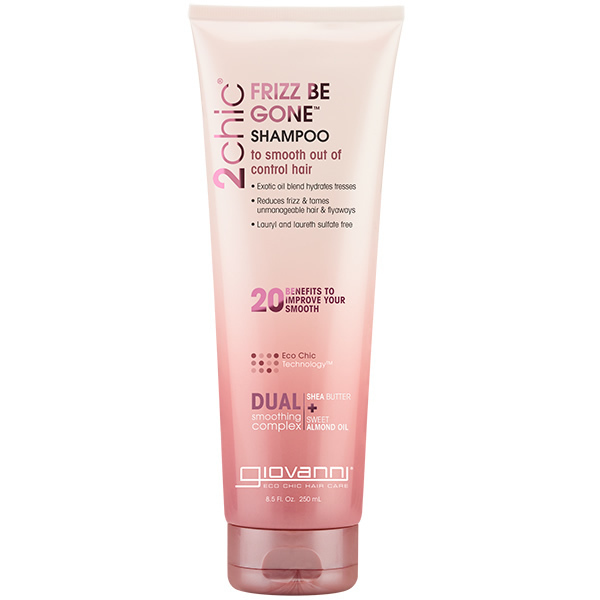 The Giovanni 2Chic Frizz Be Gone range is a luxury hair care range, without the high price tag. Every product works extremely well in not only banishing the frizz but also adding many more benefits when used. Do your current hair products offer 20 benefits? 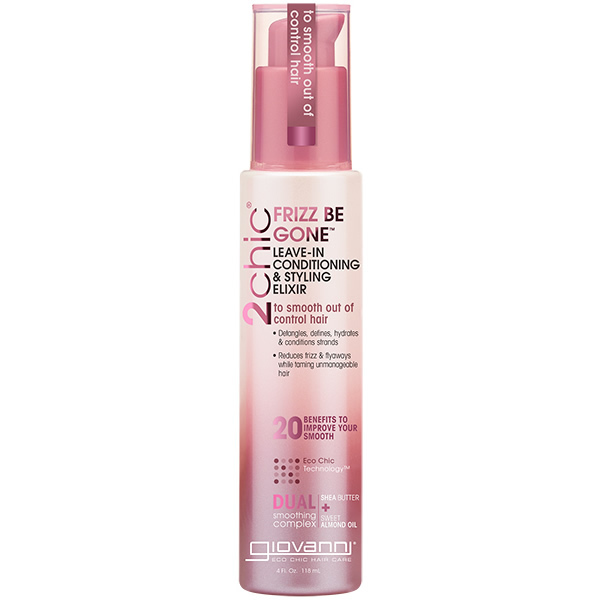 Find out more about the Giovanni 2Chic Frizz Be Gone Range at ManOrganic. X Neil.